Now easily convert Zimbra to Office 365, Outlook, Thunderbird, Adobe PDF etc. with Zimbra Converter. 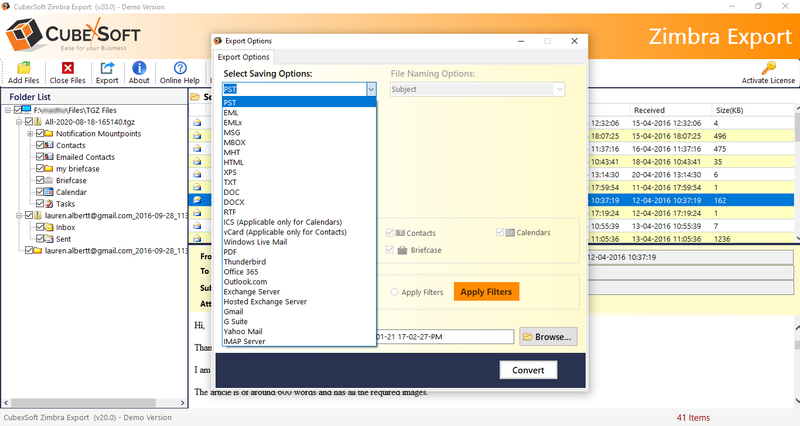 Zimbra Export Tool, developed by CubexSoft Technologies, is a smart utility that provides multiple options for Zimbra user profiles conversion to numerous popular email file formats ; Zimbra contacts to Outlook contacts, vCard, ICS and calendars to ICS. It's a powerful application that provides fast & accurate conversion of Zimbra mailbox items, which includes emails, contacts (backup Zimbra distribution list too), calendars, notes, tasks along with performing Zimbra briefcase export. If you have multiple TGZ files extracted from Zimbra, then don't worry as Zimbra Export Tool supports bulk of unlimited Zimbra TGZ files at once. Another important highlight of this Zimbra Converter Tool is its efficiency to directly select TGZ files, thus eliminating the entire process of extracting files and folders from zipped TGZ files. Also using Preview functionality, users can view the complete Zimbra mailbox items before jumping to final conversion. Zimbra to Office 365 migration is not an hectic task anymore, as Zimbra Mail Migration software introduced this saving format that allow to directly enter the login details of Office 365 and the then the tool will automatically send the resultant outcome to Office 365 database without any hassle. No supported email client installation is required to use this advance utility as it efficiently export Zimbra account data and that too with accurate details. Still having doubts, then download the FREE demo edition of Zimbra Converter Tool and get complete demonstration about its working. Demo edition will convert first 20 items from each folder of selected TGZ files to supported file formats.